Antarctic toothfish, Dissostichus mawsoni, are by far the dominant fish predator in the Ross Sea. Whereas most Antarctic fish species rarely get larger than 60 cm, Ross Sea toothfish can grow in excess of two metres in length and more than 150 kg in mass. Being top predators, they feed on a variety of fish and squid, but they are also important prey for Weddell seals, sperm whales, colossal squid, and a specific type of killer whale that feeds almost exclusively on toothfish. While these fish have long been studied for their ability to produce anti-freeze proteins that keep their blood from crystallizing, very little is known about their life cycle and distribution. We do know they live to almost 50 years of age and grow relatively slowly. They likely mature between 13 and 17 years of age (120-133 cm in length). 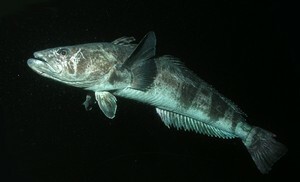 In the Ross Sea, toothfish are caught throughout the water column from about 300 metres to more than 2,200 metres deep. While most fish control their buoyancy with a swim bladder, toothfish actually use lipids or fats (lending to their popularity as a food fish). Recent research suggests that toothfish have a complex life cycle which includes a remarkable spawning migration. In the Ross Sea region, adults feed over the continental shelf and slope, and then migrate from the Ross Sea continental shelf to northern seamounts, banks and ridges around the Pacific-Antarctic Ridge system. Here in the northern offshore waters, fish release their eggs, which are then picked up by the Ross Gyre and brought back to the shelf. This hypothesis is likely, but not yet proven because Antarctic toothfish eggs or larvae have never been found. Small juveniles have been found in other regions, but never in the Ross Sea, lending even more mystery to the life cycle of this fish. 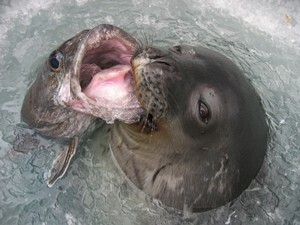 Antarctic toothfish are an important food item for Weddell seals. © Jessica Meir. Adult toothfish may live up to fifty years and weigh over 150 kg. © Rob Robbins.